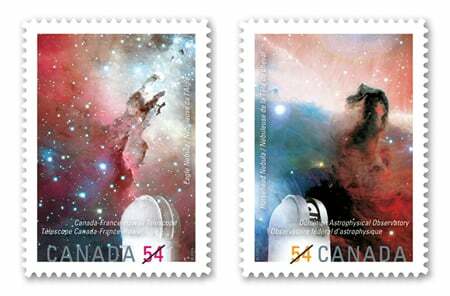 On April 2nd, 2009 Canada Post began issuing a set of stamps honouring the International Year of Astronomy. Astronomy is the study of celestial objects. It is an ancient study, with early peoples observing the heavens and the constellations with the naked eye. Obviously, with the invention of the telescope, proper scientific study got underway. Canada has, and continues to play a prominent role in astronomical research. The Canadian Institute for Theoretical Astrophysics is well respected worldwide and has contributed much to the understanding of astronomical phenomena. Many Canadians have played a key role in atronomical discoveries, such as Quebec scientist Hubert Reeves (named the «Carl Sagan of the French language»). These are very nice stamps, the overprint SS sheet that I purchased has no overprint, just a ghost image of the overprint. I am going to the postoffice to see if there are any more like this. Is there a First Day Cover for this? Ron, yes there is a First Day Cover for this issue. Was there a stamp featuring the Horsehead nebula previously? I collected stamps as a kid, and this stamp looks like one I’ve seen before. Any idea?